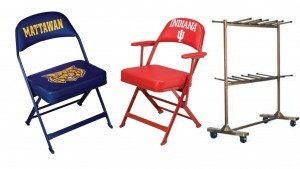 The logo seating products, sideline chairs, logo stools, storage carts, scoring tables to name a few...all made right here in the USA. All printed here also...check the competition, almost all done overseas. We are the only logo chair dealer that does their own printing, and the difference is amazing. Don't believe us? ask us for a free sample of printed chair vinyl....see for yourself.